I get excited when I see it and toss a couple stalks in my shopping cart. The family knows rhubarb well so when they see it - we have a party! Spring is here and it is time to eat some rhubarb. Why do I love rhubarb? Do you have to cook rhubarb or can you just chop it up and throw it in a salad? Is the butter to be melted in this recipe? rhubarb is very sour. it doesn't have to be cooked. but usually it's cooked with a sweeter fruit and maybe a little honey added.I just like to chop it up and cook it with a little agave or honey and cook it down until it's almost a preserve consistency. Great on scones. Thanks for encouraging me to try Rhubarb, I love it and I doubt I ever would have gone looking for it. once a year, just ONCE, when the rhubarb is fresh out of the ground, I pull out Mom's rhubarb pie recipe with loads of sugar, eggs, tapioca and really enjoy it. I know, I know -- way too much sugar, but life is a balance, ya know? I honestly want to try this but would likely need to use frozen rhubarb instead. Robin... I've seen several rhubarb pie recipes, some call for tapioca as a thickener, some don't. my mother-in-law uses it. I do not. she ate my pie once and said, 'I think Amy's rhubarb pie is better than mine', which was a HUGE compliment, because she makes the BEST pies. anyway, I use a recipe I found on allrecipes.com years ago... trying to copy/paste the link to it here. readers of this blog, and, of course, Snack-Girl as well! 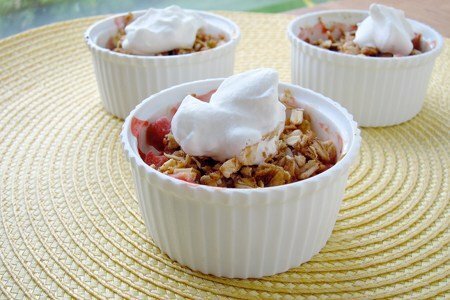 Love rhubarb - stewed, rhubarb crisp and the same Allrecipes Rhubarb pie recipe Amy put the link to above. That pie is absolutely to die for. Froze well too. I could eat the whole pie it's that good, with or without ice cream. Rhubarb freezes great for use later. Going to try this crisp recipe when fresh rhubarb is available here. I grew up with a rhubarb patch that was the pride of the neighborhood. It really is very easy to grow once the plants are established - takes one year. I have a small garden of it that is about three feet by four. Once it is a part of your garden it will last longer than you will! My family enjoys it cut in chunks; add strawberry slices if available, toss with one cup sugar or so, 1/4 cup quick tapioca, a few grates of nutmeg. Spread in a 9x13 glass pan, top with tossed oatmeal, a little melted butter and a bit of brown sugar. (you can adjust the amounts.) Bake at 400 for 45 min or til bubbly. Tastes like Springtime!!! I love rhubarb! But usually have it in crumble with loads of butter, sugar and cream. Thinks looks like a lovely slimline alternative! I made this for my Mom for Mother's Day and it was a hit! She used to make a rhubarb/strawberry pie with tons of sugar and was amazed at how little sweetener was in this. It did not need any added sweetener in our opinion as we like the slightly tart/sweet combination. Thanks for this! this sounds sooo good! perfect recipe... I’m trying this for sure!